Get the big, rich tube sounds of the world's most coveted standalone mic preamp. Now, you can get all of the beautiful, harmonically rich tube gain and classic frequency response of this iconic mic preamp in a great-sounding, easy-to-use emulation with the V76 Preamplifier plug-in, exclusively for UAD hardware and UA Audio Interfaces. 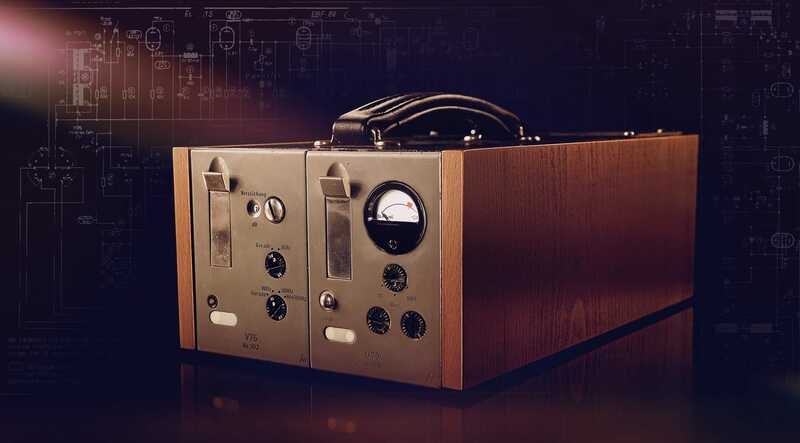 In developing the V76 Preamp plug-in, UA engineers pored over an original, fully-restored "golden" unit, serial #302, based on the original IRT schematics. We modeled every aspect of its military-grade design, including the pentode tube and transformer input and output stages, circuit nonlinearities, and clipping. Brimming with tonal complexity and 76 dB of hi-fi tube gain, the V76 Preamplifier plug-in will breathe fresh life into your mic locker and give your tracks the big, larger-than-life presence heard on some of the biggest records ever made. Perfect for nearly every source — vocals, acoustic guitars, strings, drums, or bass — each of the V76 Preamplifier plug-in's gain steps will gently shape your sounds, letting you quickly dial in "mix-ready" tracks. Harnessing UA’s Unison technology, the V76 Preamplifier plug-in blurs the lines between analog and digital, giving you all of the original hardware’s impedance, gain staging “sweet spots,” and circuit behaviors. The secret is Unison’s bi-directional control and communication from the V76 Preamplifier plug-in to the digitally controlled mic preamps in UA Audio Interfaces. Of course, the V76 Preamplifier plug-in isn’t just for UA Audio Interface owners. UAD hardware owners can use the V76 Preamplifier on any mix, getting bold, rich colors, without going outside the box. With the V76 Preamplifier's complete circuit emulation, you can craft your projects with the same rich flavor heard on countless classics. i think this is not for u guys who want to have a clean sweety sound:-). this makes color and has of alot of great character. love this one!! Absolutely beautiful sounding preamp. I use it primarily as a unison plugin to track vocals and I love the way it adds weight and colour. Impressed with the results by such a simple plugin. Just dial in the harmonics to get that expensive vocal. Achieve rich tones with so much detail in combination with my standard chain 1176 into LA2A. Hands down the best preamp I own for vocals! I can't say exactly what it sounds like, just to say that it gives that polished pro sound. Using an AEA KU5A to V76 to LA2A and a touch of verb. Straight out of the box, the most satisfying plug in I have ever purchased. As with almost every plugin from UA, this plugin really does what all the other 5 star reviews say it does. I love driving it hard just to be blown away at how truly like the hardware this sounds, and in my plugin journey I have yet to come across any competitors that can hang with the realistic characteristics in these plugins. The V-76 is another great in the plugin catalog, and if you don't own it , you are missing out. This plugin will find its way on to many, if not all vocal tracks , and many others in the future. As always Universal Audio puts them all to shame. Thanks Guys. You freaken rock. I’m enjoying the sound of this plug on vocals and acoustic guitar. I’m using it as a colour plug post recording as well. It gives a certain sound, like a transformer. I was waiting for this plugin release to happen. I”ve been super happy with this plugin the amouth of clarity it brings to my recordings in unison mode is just what i needed! Used on Vocals, and was very impressed. This preamp is great for coloring an instrument, giving it some of that x-factor analog magic. Great for tracking and mixing. Currently tracking EVERYTHING through V76 on my new Apollo. Synergy. Tone. Glorious. The vibe, the impressive gain it gives outstanding! Don’t hesitate, just do yourself and your tracks a favor. The V76 has really nice saturation characteristics. I am utilising it often within mixing and stem mastering projects. Just makes everything a little bit better. Great distortion. Great filters. Need a lot af dsp though, like all other nice plugins with good distortion. Got the V76 Pre and did a session that night recording Electric guitars. Sounded great with a nice edge and very musical EQ. Tried it next day on electric bass with great results. Can't wait to track drums! The V76 Preamplifier clearly is one of the richest sounding preamps available to date. The harmonics are simply beautiful. The tone becomes more solid and mix-ready just passing through the preamp. The filters have ideal filter points and slopes and sound stunningly lush. When driven hard the distortion feels absolutely analog. No digital harshness here. Amazing work! Thanks Universal Audio, this makes tracking and mixing even more fun! Love the crunch and filters! Great for use with unison pre or as a distortion flavour or roll of filter. Awesome sound! This is a great little plugin for adding some retro grimey tones to your tracks and delivering good up front mid-punchy vocal sounds with unison. If you really push it then for once the distortion doesn't sound solely like digital clipping but something a little more complex and it's all the better for it. I'd place this as one of the top Unison plugins even if it is very situational, it's a one trick pony, but what a trick! Just don't overuse it. This plug in is am elegant beast. I feel like Marlene Dietrich is the room when I sing. It is so utterly hauntingly elegant, rich, and harmonic in its capturing of the human voice - and it is oh so gorgeously whispery in its mids. A work of art, folks at UA. Well done.